Continued top-line deceleration and disappointing guidance have erased most of Zuora's gains in the year-to-date, while most SaaS stocks have returned to all-time highs. A global focus on subscription offerings should make Zuora's offerings more relevant today, especially with new offerings like Disney+. Zuora's revenue mix also continues to improve, with subscription revenues growing much faster than services revenues, improving margins and profits. In my view, it's the wrong time to be selling Zuora. Though it's true that the company's revenue growth has decelerated (the same is true of most software companies as they grow larger and fill more of their existing TAM), Zuora's market opportunity has only been made broader by the renewed focus on a subscription-oriented economy. We've heard a lot of noise in the media lately about big media giants turning to subscription offerings. Perhaps one of the splashiest of these announcements was the introduction of Disney Plus (DIS), a $6.99/month subscription to access a trove of content across the Disney, Marvel, Pixar, and Star Wars brands. As more and more companies seek to gain recurring revenue streams by offering subscription services, Zuora's platform becomes far more relevant. Though Zuora is only a recent IPO (it went public in April of last year at $14 per share), it's hardly a startup. It's forecasting just under $300 million of revenue in the coming year and counts some powerhouse names among its customers. 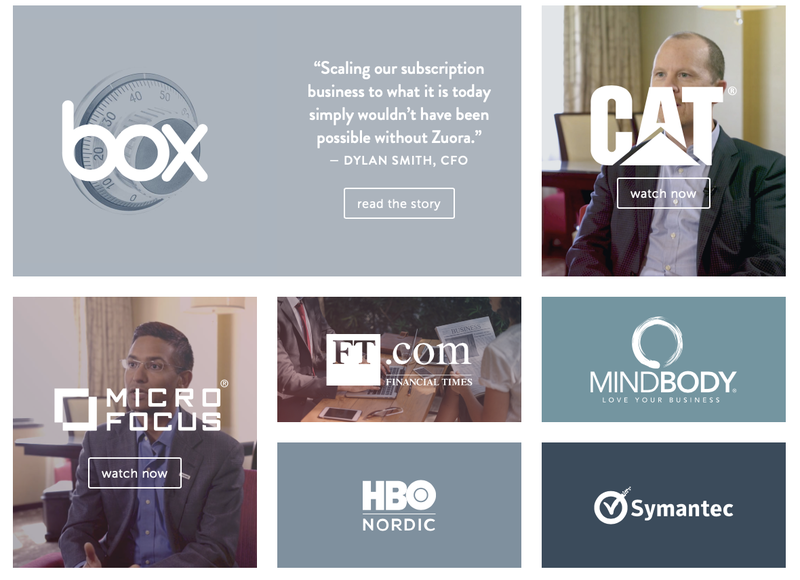 The snapshot below, taken from Zuora's marketing website, showcases some of its anchor customers; other major clients not shown below include Intuit (INTU), Autodesk (ADSK), Ericsson, HBO, and Time Inc. In my view, announcements such as Disney Plus are just the tip of the iceberg as more and more companies look to replicate the success of the SaaS billings model. Zuora's positioning as a niche provider of revenue management tools for subscription companies (with virtually no specialized competitors in the market) gives it a huge advantage in capturing additional growth. The fact that it already works with large names such as those pictured above give it the credentials to go after large enterprise clients. Zuora is also staying on top of innovation - last month, the company announced five new patents specific to helping subscription companies manage their business. Included in these new tools are a method for projecting recurring revenues as well as optimizing product performance. Build a position in Zuora's stock while it's still down. 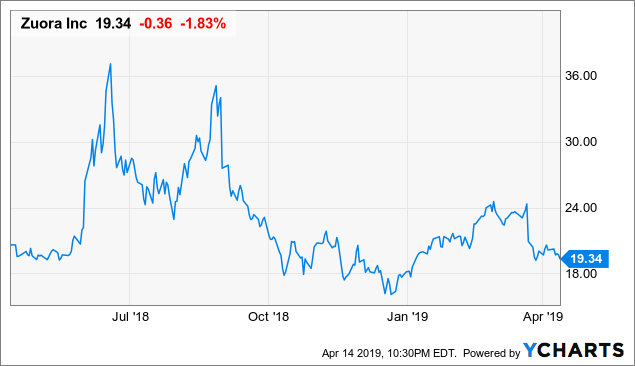 Expectations are low for Zuora in the coming year, and the growth opportunities afforded by the rise of the so-called "subscription economy" may produce unexpected results for this downtrodden stock. Zuora's valuation is one of the most attractive elements of its bullish thesis. At its present share price just above $19, Zuora trades at a market cap of $2.10 billion. 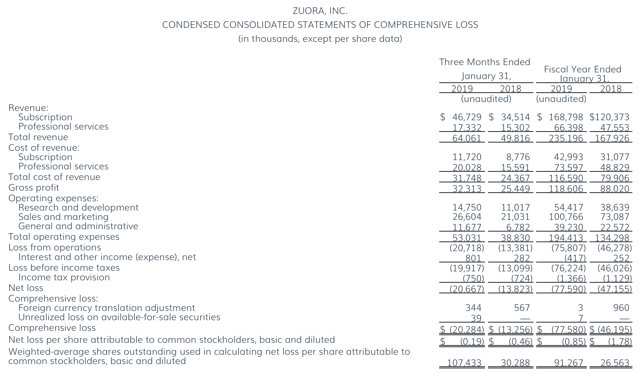 After netting out the $187.9 million of cash and $13.5 million of debt on its balance sheet, Zuora has an enterprise value of $1.93 billion. The company is pointing to $289.0-$293.5 million in total revenues, representing 24% y/y growth at the midpoint versus this year's revenues of $235.2 million. Subscription revenues, meanwhile, are expected to grow 25% y/y to $209.0-$211.5 million. The perceived weakness of this guidance is one of the main reasons that Zuora's shares fell in the aftermath of the Q4 print. Wall Street had expected total FY20 revenues of $295.5 million, or about one percentage point higher than Zuora's current guidance. In my view, however, Zuora's lower growth has already been priced into its relatively modest valuation of 6.6x EV/FY20 revenues. Note that immediately after its IPO, Zuora notched an all-time high of $38 - approximately double where the stock stands today. 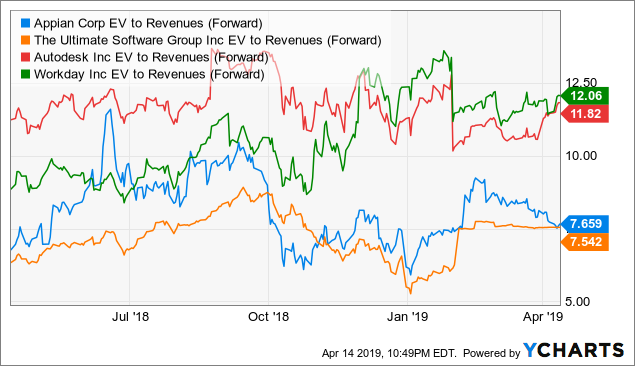 While Zuora was clearly overheated at the time and may not return to such levels for a while, it wouldn't be implausible to see Zuora at $24 by year-end, representing 8x EV/FY20 revenues and 23% upside from current levels. Total revenues grew 29% y/y to $64.1 million, surpassing Wall Street's expectations of $62.8 million (+26% y/y) by a strong three-point margin. Subscription revenues, on the other hand, grew 35% y/y to $46.7 million. Despite beating Wall Street's top-line estimates, we're still disappointed by Zuora's noticeable deceleration from prior quarters' growth rates. In Q3, Zuora had grown total revenues and subscription revenues at 33% y/y and 43% y/y, respectively. In Q2, Zuora had grown total revenues at a breakneck pace of 47% y/y. Still, we remain encouraged by the fact that Zuora's revenue mix is improving. Among software companies, Zuora is a laggard when it comes to gross margin due to its high percentage of revenues derived from professional services, which the company performs for below cost. The fact that subscription revenues have consistently outpaced total revenue growth, however, is a strong signal. Subscription revenues comprised 73% of Zuora's total revenues in Q4, four points higher than 69% in the year-ago quarter. We also note that, for each of the past several quarters, subscription revenue growth has far outpaced total revenue growth. Zuora's FY20 guidance, however, calls for total and subscription revenue growth to be relatively on par with each other at ~25% y/y. In my view, there's a good chance here that Zuora is being overly conservative with its subscription revenue guidance. Zuora also reported that its dollar-based net retention rate clocked in at 112%, the high end of the range it was predicting (it continues to see 108-112% as its long-term target). The company also saw a 27% y/y increase in the number of large customers with annual contract values (ACV) in excess of $100,000. Both metrics suggest that Zuora continues to stay relevant among large enterprises and is succeeding at renewing and upselling into its current install base. 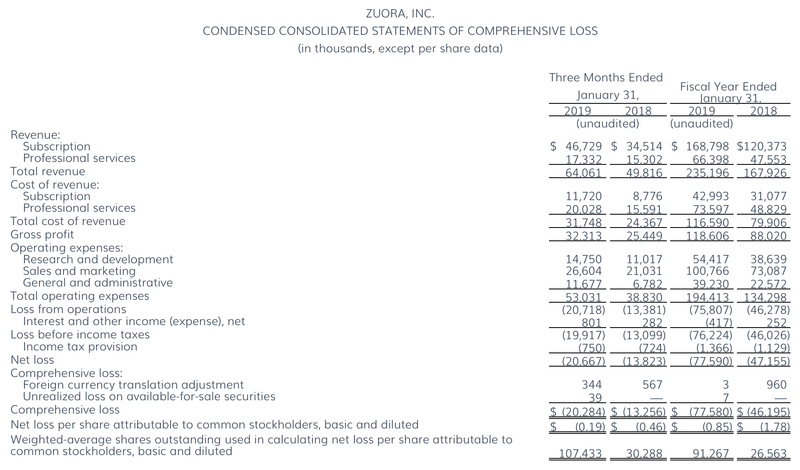 Also key to note is that Zuora's cash flow margins are improving. Operating cash flows ended FY19 at -$23.6 million, versus -$24.8 million in the prior year. This represents an FY19 OCF margin of -10.0%, 420 bps better than -14.2% in the year-ago quarter. Alongside a stronger subscription revenue mix and better operating margins, it wouldn't be unreasonable to see Zuora hitting OCF breakeven within a year. The bears have descended on Zuora and are citing a handful of risks to the stock this year. Chief among them is the deceleration in its revenue growth as well as the light guidance for FY20. Can Zuora survive in a hyper-competitive software market where ERP and revenue management tools from the likes of Oracle (ORCL) and SAP (SAP) dominate the market? In my view, Zuora's niche positioning gives it a true advantage against cookie-cutter products from the software giants. As more and more large companies like Disney begin to offer subscription services, Zuora's relevance grows - especially as it continues to innovate and produce tools specific to subscription-based businesses. Zuora's supposedly light FY20 guidance may not capture all of these newfound opportunities in the market. With Zuora's stock looking significantly undervalued against an again-hot tech sector, investors would be wise to buy on dips. Disclosure: I/we have no positions in any stocks mentioned, but may initiate a long position in ZUO over the next 72 hours. I wrote this article myself, and it expresses my own opinions. I am not receiving compensation for it (other than from Seeking Alpha). I have no business relationship with any company whose stock is mentioned in this article.